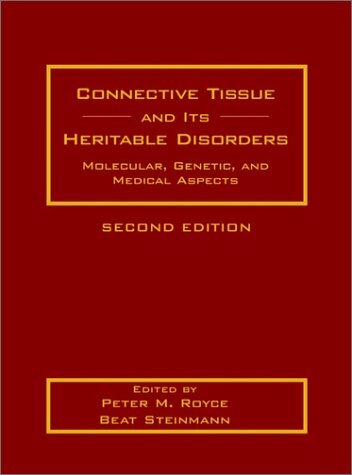 Connective Tissue And Its Heritable Disorders : Molecular Genetic And Medical Aspects Second Edition (Hb): 9780471251859 Hardcover - LIMEROCK BOOKS INC. The Second Edition of Connective Tissue and Its Heritable Disorders: Molecular, Genetic, and Medical Aspects is the definitive reference text in its field, with over 40% more pages on the nature, diagnosis, and treatment of disease than its predecessor. Collecting new research on disorders detailed in the first edition as well as on those previously excluded, editors Peter Royce and Beat Steinmann provide the most up-to-date clinical and scientific information for medical specialists treating affected individuals. Features of this revised and updated volume include detailed reviews of the clinical diagnosis, mode of inheritance, risk of recurrence, and prenatal diagnosis of each inherited connective tissue disorder; a thorough description of the morphology of connective tissues; a completely updated and revised section on the biology of the extracellular matrix; and the addition of syndromes such as craniosyntosis, and disorders of sulfate metabolism. This volume provides extensive coverage of the structure, morphology and function of connective tissues - e.g., skin, bone, cartilage - and detailed reviews of extracellular matrix constituents - collagens, proteoglycans, elastin, glycoproteins - at the molecular and macromolecular levels. This serves as a background to fully illustrated, comprehensive reviews of heritable disorders of connective tissues such as osteogenesis imperfecta (brittle bone syndrome), Marfan syndrome, and the Ehlers-Danlos syndrome. The entire volume will be of use to scientists working in the area and to clinicians responsible for the diagnosis, treatment, and management of patients suffering from these generally crippling, debilitating. or even fatal, conditions. Also considered in appropriate chapters is the prevalence of genetic predisposition to common diseases such as osteoarthritis, rheumatoid arthritis, osteoporosis, and arteriosclerosis.